The 5th edition of the RORC TransAtlantic Race starts on the 24th of November in Lanzarote and finishes 2995nm later in Port Louis Marina, Grenada. This year, we have individual spots available on Pata Negra, a Marc Lombard designed IRC 46. Built in 2016, this light weight, fast, performance racing yacht is perfect for this event, with a proven track record offshore. Pata Negra benefits from a large asymmetric sail plan and a carbon rig, which can produce speeds in excess of 20 knots. Marc Lombard is one of the most successful designers of Offshore Open Class racing yachts and it really shows. Not only is Pata Negra fast, her fitted interior makes her a comfortable boat for extended offshore sailing in a event such as the RORC Transatlantic Race. This summer she has taken part in both the Newport Bermuda Race and the Atlantic Anniversary Regatta and proven herself. Onboard Pata Negra for the Newport Bermuda Race were a team from the Russian Offshore Sailing Club, SeaVentus. Only the 2nd Russian team to have entered the event, they had a fantastic time and enjoyed their race! As this email lands in your inbox this afternoon, Pata Negra is currently taking part in the Atlantic Anniversary Regatta, where she’s sitting at 2nd in IRC One currently, with just over 500nm to go until they reach Hamburg. The RORC TransAtlantic race is the is the newest and lengthiest offshore race in the RORC programme. 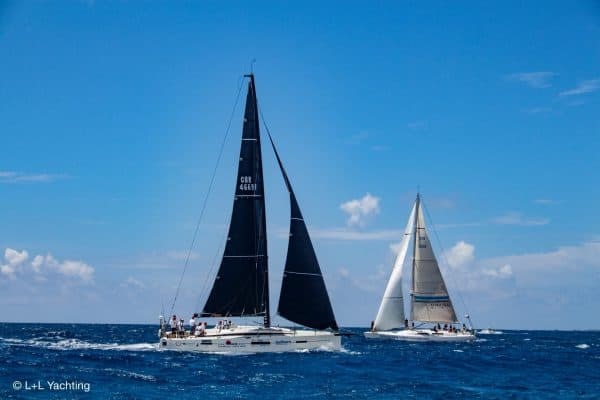 The race has established itself as the definitive offshore transatlantic race bound for the Caribbean and attracts sailors from around the world on a competitive and diverse fleet of yachts ranging from 9 to 30 metres (30-100ft) in length. With RORC focused on maintaining a safe and high quality race, crew must be able to prove offshore sailing experience with a minimum of 50% of the crew having sailed 500nm offshore in the previous 18 months. If you choose to join us for this event, crew can assist with the delivery in order to get to know the boat! A highlight is always the Welcome Party, to size up the competition, before heading off across the Atlantic to the finish in Grenada. In Grenada the party atmosphere is guaranteed to continue, finishers will be welcomed day and night with the hospitality for which Grenada is famous. The individuals price is £4000pp and includes 2 professional crew onboard, race entry fees, provisioning for the crossing, all boat expenses, required safety equipment and crew t-shirts.